I love how autumn becomes a season of celebration. The first russet leaves fluttering from the trees to signify the start of September, melting into costume preparations and carving pumpkins in October for Halloween. The chill in the air descends like a thick blanket once November hits, all scarves, gloves and sparklers watching fireworks light up the sky on Bonfire Night. Then as soon as it comes, it is gone and we throw ourselves completely into the preparations for Christmas. Slow down autumn, we’re not quite ready for eggnog lattes, mulled wine and gingerbread houses just yet. Autumn is a colour synonymous with shades of orange from pumpkins to leaves but there are darker hues that signify the change in season. The sky is the deepest navy once the clocks go back and chocolate brown is hugged in mugs of cocoa, indicating the range of colours present at this time of year – and that mere orange just cannot suffice alone. I realised this breaking into a bar of milk chocolate laced with candied walnuts and a hit of maple and hurriedly scribbled down an idea for a cake. In my sketch it was outrageously grand, celebratory in nature but since my blog has just turned three, I thought I’d make an occasion of it. 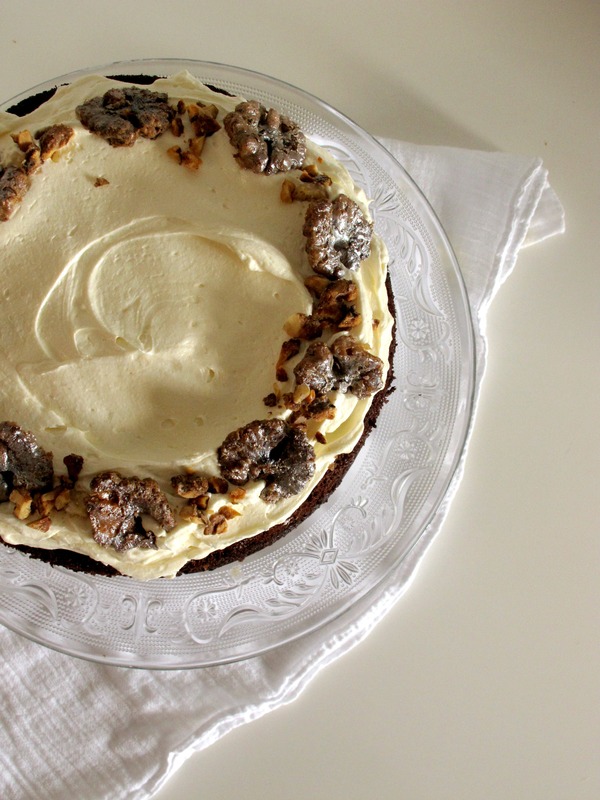 Thus, a Maple and Candied Walnut Chocolate Celebration Cake was born. I added candles then blew them out myself. 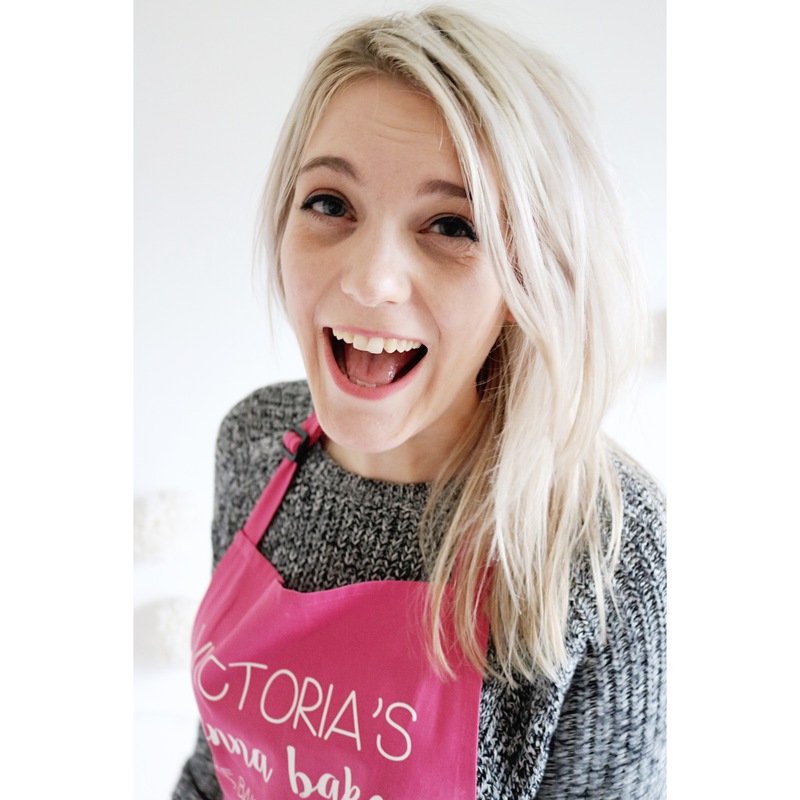 Happy birthday Victoria Sponge Pease Pudding. I suppose you could say I am still learning, looking back on old posts I wonder how I ever had the gall to present pictures so horribly saturated, but then I remember the excitement that a new blog brings. If you like to write, or take pictures or do anything creative then I highly recommend it. 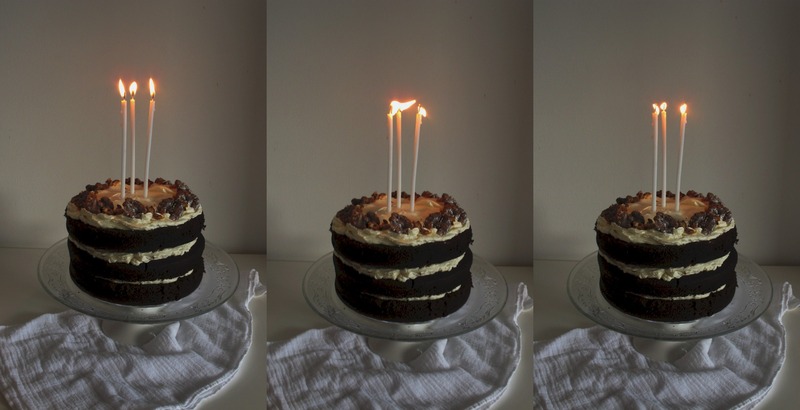 Blogging has been a terrific journey and one that has seen me cry over cakes (not literally though), fight for the right to my pictures and meet some really nice people who are just as annoying as me when I’m armed with a camera and a plate of food in front of me. 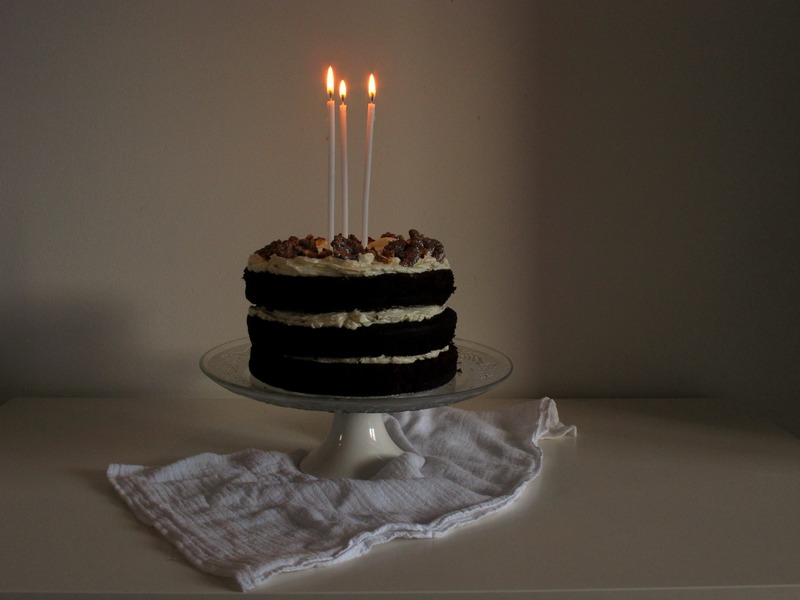 I wanted to celebrate the fact that I am always learning with VSPP in this cake, trying two new-to-me techniques in the process to create towering slices of fudgy chocolate cake, cloud-like maple Swiss meringue buttercream and sweet candied walnuts. Similar to Italian meringue buttercream in concept, Swiss is perhaps slightly easier in that in theory you can make it without a thermometer if you aren’t fussed about the tiny risk posed by egg whites, which you won’t find with Italian meringue as a hot syrup is used instead of cooking over a bain marie. But the result is a thick fluffy meringue frosting that holds up well in the fridge and is soft and melting when eaten at room temperature. Looking at the recipe may seem daunting but I promise, I made this cake extremely lazily one Saturday morning and was completely finished within four hours. If you are baking it for a celebration then I would highly recommend getting your ingredients weighed, your cake pans greased and lined and even candied walnuts made in advance to stop your cake stresses. Believe me, after three years and countless cakes, that’s one thing I’ve learned time and time again. 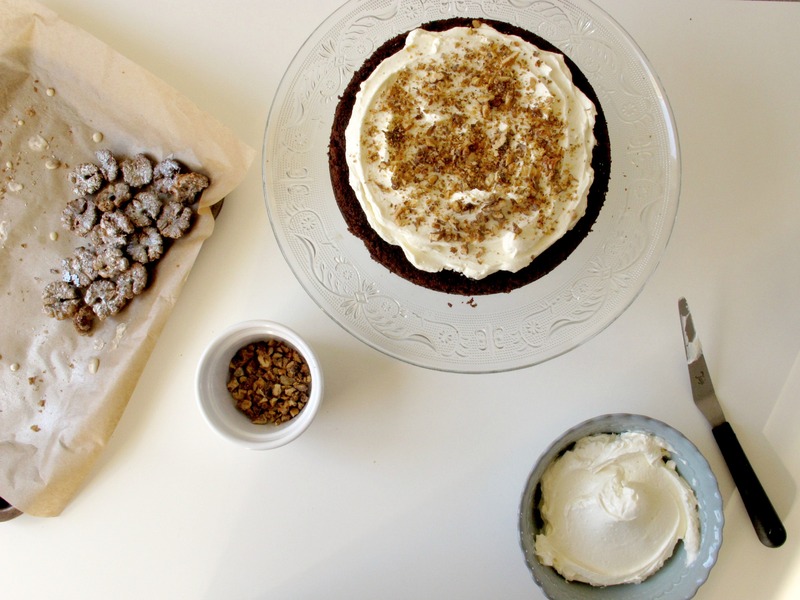 There’s still plenty of time to bake gingerbread and mince pies, so let’s hold on to autumn a little longer shall we? To make the candied walnuts, place the sugar, maple syrup and water in a pan over a medium heat until the sugar has dissolved and it begins to boil. Place the walnut halves in a bowl and pour over the syrup, stirring for a minute and leaving to steep for three. Place a sheet of baking parchment on a baking sheet and top with a wire rack then carefully scoop each walnut out of the bowl and place on the rack. Allow the syrup to drip off the walnuts as you preheat the oven to 170oc/150oc fan. Once drip dried, place on a baking sheet lined with fresh parchment and bake for 15 minutes, stirring the walnuts every five minutes until golden. Remove from the oven and leave to cool. Pick around ten to 12 walnut halves and spray with edible silver paint before leaving to dry. To make the cake, grease and line three 18cm sandwich tins with baking parchment and preheat the oven to 180oc/160oc. Place the chocolate in a heatproof bowl over a pan of barely simmering water and slowly melt before removing from the heat and leaving to cool slightly. Meanwhile, whisk the boiling water and cocoa powder together in a separate bowl and add the buttermilk. In another bowl, whisk together the flour, bicarbonate of soda and salt and set aside. In the bowl of a stand mixer fitting with the paddle attachment, beat the butter and sugar together for around five minutes. It will clump together like dough but persevere; it will go smooth as the butter melts slightly. Add the vanilla and a third of the eggs then beat again, adding the remaining eggs until the batter is smooth and a nice caramel colour. Scrape down the sides of the bowl and beat again briefly then turn the mixer to low and pour in the melted chocolate. Once mixed and the sides scraped, add half the buttermilk and a third of the dry mix and beat on low. Repeat again then fold in the last of the flour, ensuring the batter is smooth and the ingredients are well mixed. Divide between the three tins and bake for 25 to 30 minutes until a skewer inserted in the middle comes out clean. Remove from the oven and cool in the tins for 10 minutes before turning out and removing the parchment paper, leaving to cool completely. To make the maple Swiss meringue buttercream, place the egg whites, sugar and salt in the bowl of a stand mixer and place over a pan of barely simmering water, ensuring the bowl doesn’t touch the water. Stir using a whisk until the sugar has completely dissolved – you can tell by rubbing the mix between your fingers without feeling any sugar grains. If you want to pasteruise the mix, carefully heat to 70oc using a sugar thermometer or simply remove from the heat once the sugar has dissolved and place back in the stand mixer with the whisk attachment. Whisk on high until stiff peaks are formed and the bowl has cooled to room temperature. Add the butter piece by piece with the mixer still running until the meringue is a buttery yellow. Add the maple syrup and whisk to incorporate, then you are ready to put the cake together. To assemble, place one of the cakes on a cake stand and smooth over a third of the buttercream. Sprinkle over half the chopped candied walnuts then top with the second cake and repeat again. Place the final cake on top, upside down to create a flat top and spread over the remaining buttercream, finishing with a swirl by pressing down with a palate knife at an angle and spinning your wrist round in a quick motion. 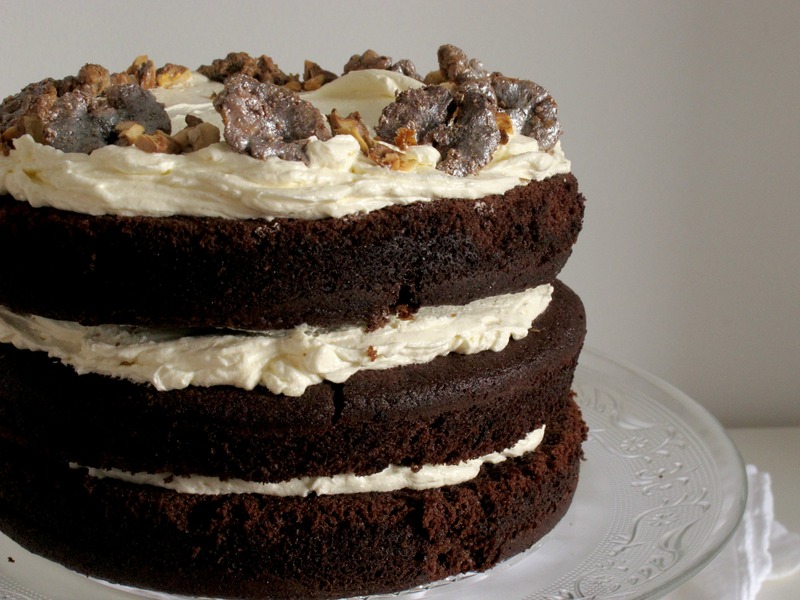 Press the silver walnut halves around the cake standing upwards and scatter any remaining walnut pieces in between. Add long spindly candles and serve.